This week saw us saying a fond farewell to Architecture of the heart as the changeover of exhibitions began in the Crombie, Arnott, Malden and Nelson galleries. This process will take four weeks and our autumn suite of exhibitions will open to the public on Saturday 29th March. If you are visiting MTG in March take the opportunity to have a peek into the galleries to see the staff transform the galleries and learn more about the process of deinstalling and installing new exhibitions. The first week of the changeover saw the deinstallation of Architecture of the heart. This exhibition included over 100 artworks and objects from the Hawke’s Bay Museums Trust collection as well as a small number of works on loan from private lenders and other institutions. Artworks were taken off display, condition checked, then carefully packed. 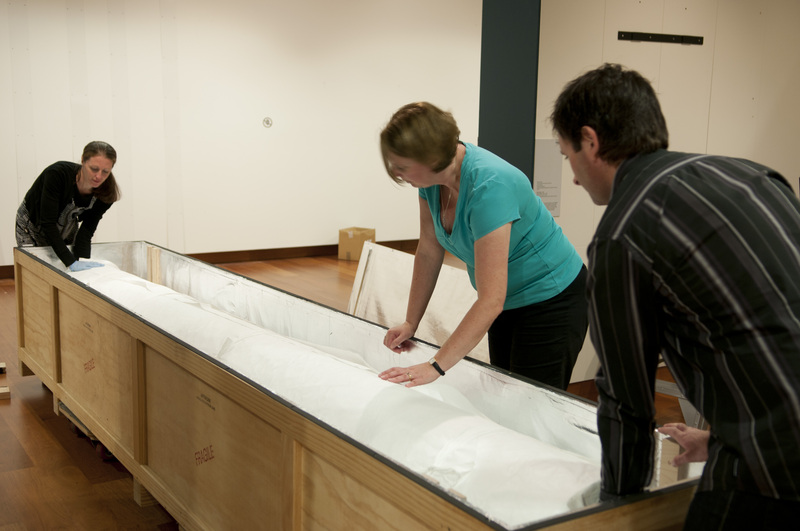 Works from private lenders and other museum and galleries were packed into transport packaging and returned to various parts of New Zealand. 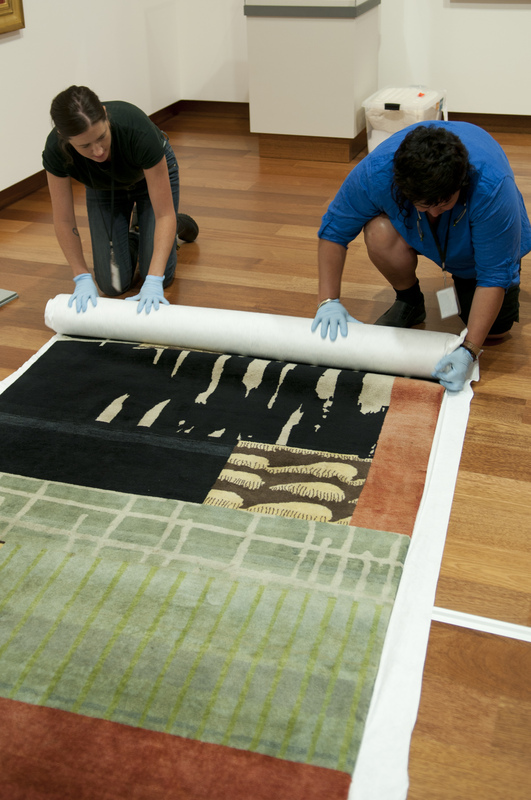 Nina Finigan and Dena Hale rolling a rug from the installation Atelier Martine Reprised (2013) by Gavin Chilcott. Nina Finigan and Jonathon Brown carefully place Claudia Pond Eyley’s Turquoise Shield, (1983-1984) into its specially designed travel frame. Two of the larger works had oversized travel crates which had to be hoisted up over the glass balcony with scaffolding and rigging before the works could be taken off display. The crates were then hoisted back down carefully over the balcony. 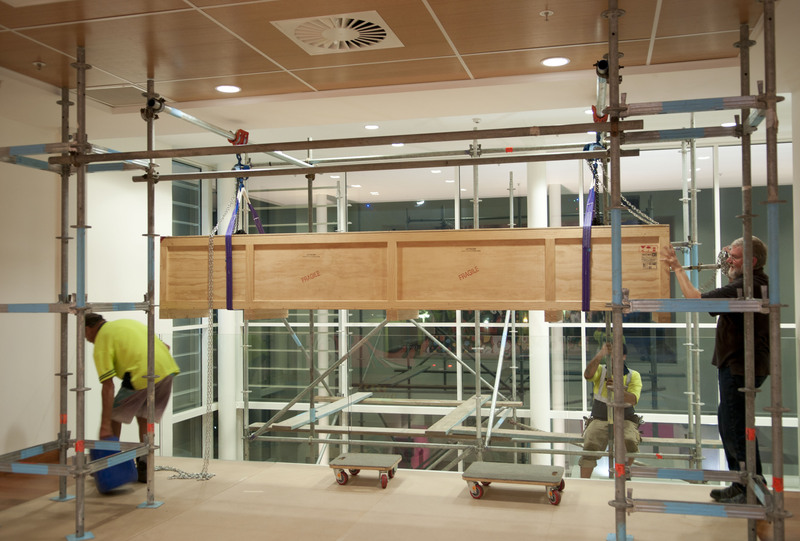 The crate is lifted over the glass barrier on the first floor balcony. 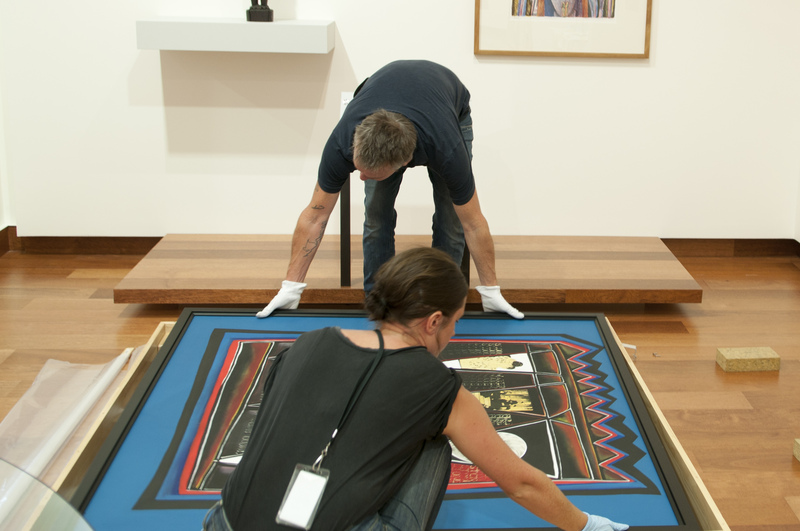 Sara Browne, Sasha Smith and James Price carefully place an artwork into its large travel crate, ready to be hoisted down over the first floor balcony. The crate is carefully hoisted back down over the balcony. This entry was posted in Uncategorized and tagged art, artists, autumn, changeover, deinstallation, Exhibition, gallery, Hawke's Bay, Hawke's Bay Museum Trust, Hawke’s Bay Museum & Art Gallery, Hawke’s Bay Museums Trust, installation, mtg, MTG Hawke’s Bay, Napier, paint by Sarahp. Bookmark the permalink.